I thought a lot about Richard Linklater in the weeks leading up to our move to Church of the Cross. I had never been to Austin before my interview in December. For better or worse, my sense of the city was shaped by movies like Slackers and Dazed and Confused. 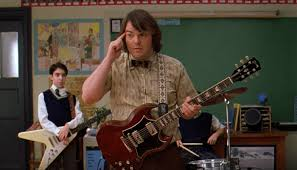 Another Linklater movie, though, has been on my mind this week as I reflect my experience at COTC thus far: School of Rock. Do you remember it? It’s an ageless combination of adorable kids, a killer soundtrack, and peak Jack Black. It’s also a parable of how grace undermines (and outperforms) a culture of pressure and performance. The movie is set in an elite prep-school. The problems are predictable: harried kids, hurried parents, and miserable teachers. Dewey Finn (Black’s character) enters the picture as a (fraudulent) substitute teacher who takes over the school band. His love for music overcomes his students’ resistance. His unconditional acceptance creates an environment where every kid - regardless of aptitude - plays an integral role. The plot itself is not particularly believable, but the ‘moral’ of the story - that love and affirmation produce more goodness and creativity than fear, obligation or demand ever could - is undeniably true. What does this have to do with Church of the Cross? It’s easy for church to feel like the prep-school ridiculed in the movie: we’re trained to calculate our worth before God by how much we give, work, or witness. We’re included to the degree that our gifts and interests align with the larger mission. Fortunately, my initial experiences with Church of the Cross have been more like Dewey Finn’s music class. This church feels indeed like a place of celebration and consolation for all. The ear-to-ear smiles of COTC kids “following the cross to the garden” is a picture worth a thousand words. I'm just starting to wade into this community. Like every church, it disappoints some and falls short of its ideals. It’s worth underscoring, however, the impression it has made on me and Meg and how grateful we are to be part of this family. In the coming weeks we’ll be reaching out to many of you. We want to hear your stories, learn about what drew you to Church of the Cross, and dream together about what God might do through this church. Be encouraged to reach out to us as well. We love checking out restaurants, exploring city parks and (if you hadn’t guessed) going to movies.